We’re adjusting to life in Uganda, which is really not too difficult. 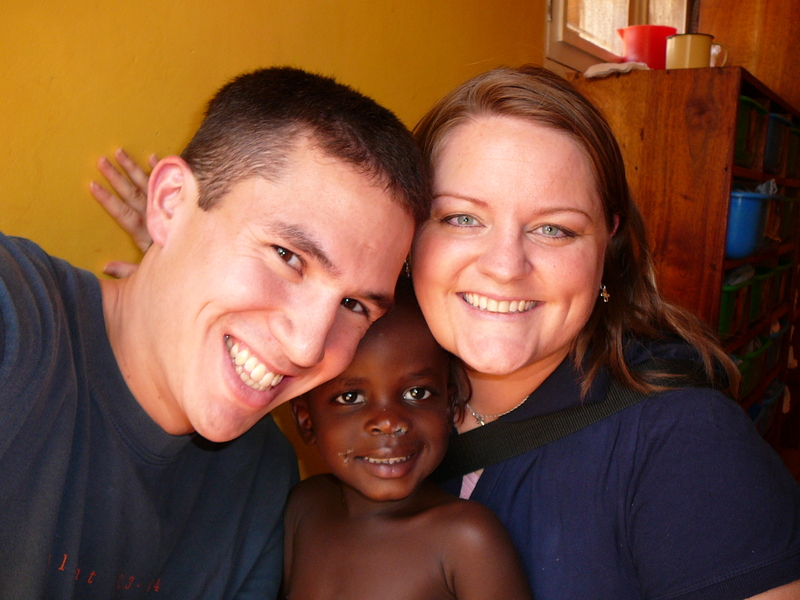 We both love it here and have considered serving the Lord in Africa for an indefinite period of time. There are inconveniences, but the degree of inconvenience that we (or you) experience depends on controllable things like expectations, attitude, and perspective. I would say that being here makes me more thankful for things I have in the States like fast and reliable internet access, but I’m trying to overstep that mindset because it should be secondary. When considering the object and the degree of my gratitude, I don’t want to focus on cultural comparisons but objective spiritual realities. I should be thankful for fast internet in America and slow internet in Uganda because what I deserve is zero internet in hell. I will definitely be cracking jokes about some of Africa’s inconveniences and inefficiencies, but (hopefully) not because I think I deserve better. If you’re wondering what it’s like (at least in Uganda), you ought to come sometime. The weather is hot and humid, and they tell us that it’s basically like this year round since Uganda is on the Equator. The people are friendly and sometimes cautious, but they seem to respond kindly when I initiate greetings. Mzungus (white people) stand out in a way different than any particular race in Southern California where I live. The best way to describe how people look at us when we walk down the streets is the way Americans give extended looks to people in wheelchairs — gazing a bit awkwardly at the novelty and not quite comfortable enough to offer a greeting. The food has been very good, and Cindi tells me it’s heavy on the carbs (I don’t notice that stuff) — rice, beans, potatoes, greens, eggs, bread, fish, and other meat occasionally. We haven’t even had mutoki yet (unripe, mashed bananas) even though it’s the staple food of the Ugandan diet. That’s OK with me — I’m not a big mutoki fan. Transportation is by walking, by packed taxi-van (and I mean packed), by boda-boda (bicycle taxi), by piki (small motorcycle taxi), by the orphanage van, or by the vehicles of missionary friends. So far we’ve mostly walked but have traveled using all of the above means except the ridiculously-packed van (it has a name but I don’t know what it is) and the boda-boda. I plan on riding a piki through town with the video camera rolling — a live, rolling, hopefully-safe documentary. I know I’ll look like the classic idiot tourist riding down Main Street with camera in hand, but it’ll be worth it. We’re staying at Hotel Triangle which is right on the edge of Lake Victoria as it begins to form the River Nile. It’s a 7-minute walk from the orphanage, and our room has an absolutely gorgeous view of the lake/river and the island on the other side. I suppose that’s enough culture for now — on to the kids. We’re with Judah most of the time that he’s awake each day. He wakes up between 6:00 and 7:00am, although we haven’t been at the orphanage for this period of time yet. I think he does his devotions between 7:00 and 8:00am (just kidding; I don’t know exactly what they do during this time). At 8:00am they eat, from 8:00-10:00am they play or sing or exercise with the mamas and the volunteers. 10:00am is snack-time, which Judah takes very seriously. From snack-time until noon they continue to play and do various things planned for them by the orphanage staff (we usually hold Judah and the other kids, walk around the property with him, and just hang out). Lunch is at noon followed by a quick bath and a nap until 3:00pm. We usually watch Judah eat lunch with his buddies, wait for the bath-and-diaper drill, and put him in his crib before leaving to head into town (15-minute walk from the orphanage). We try to return around 3:00 or 3:30pm when family time on the front lawn begins. This is the most precious time of the day — all the kids and all the workers hang out on the lawn together sitting, walking around, playing, and just being together as the sun sets and the temperature relents. I like to hang out with Judah or run around with the rest of the kids or swing them until the line of kids clinging to my legs and pushing on each other and pleading “Uncle, also me? !” either dies down or gets a bit insane. If you want to feel loved, needed, and not unlike a human playground, come to Amani Baby Cottage. 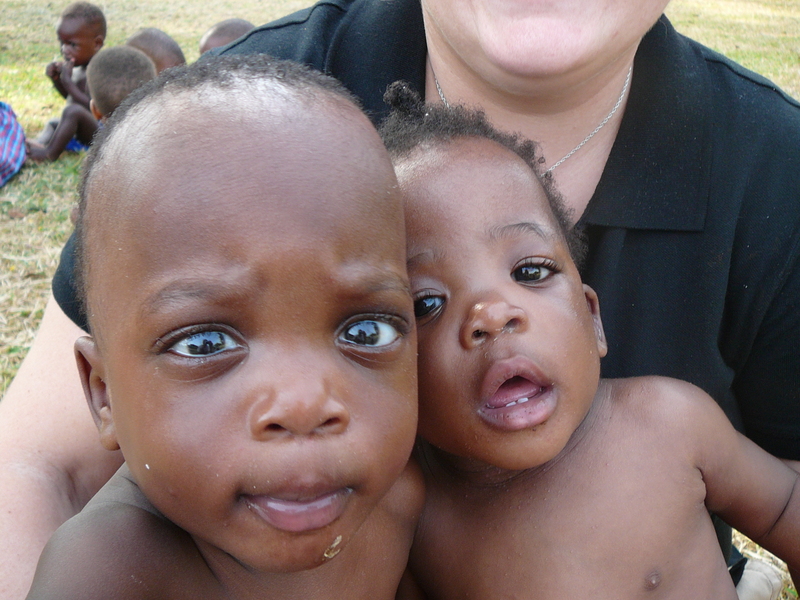 You will see a small picture of why God loves orphans and why He calls us to do the same. At 6:00pm is dinner followed by bath and bedtime. We put Judah to bed each night and then walk either to dinner or to our hotel. We fall asleep between 8:00 and 9:00pm each night and wake up naturally between 5:00 and 6:00am. Just like being an RD and a seminary student! Judah is a pretty docile fellow. He’s very calm and collected most of the time, and he doesn’t respond to much either positively or negatively. You can tell he’s not slow; he’s just kind of cool-like-the-other-side-of-the-pillow. His laugh is an absolute treasure, he eats more food and he eats it faster than any other kid at his table, and he walks bow-legged and wobbly like a little gorilla (they tell us he only started walking in the past few weeks). So far he enjoys playing with Cindi’s glasses, water bottles, and bracelets that Cindi brought for the workers. 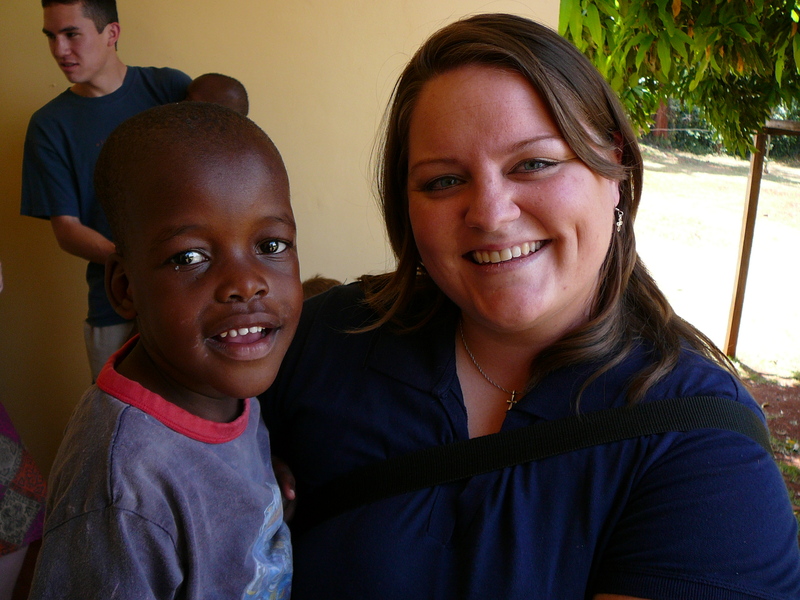 He definitely recognizes us now, and he always runs to Cindi and puts his arms up asking her to pick him up when we arrive at the orphanage after being away. He doesn’t manifest it often, but he does have a pretty good and instantaneous temper that he lets out occasionally when he doesn’t get something he wants. 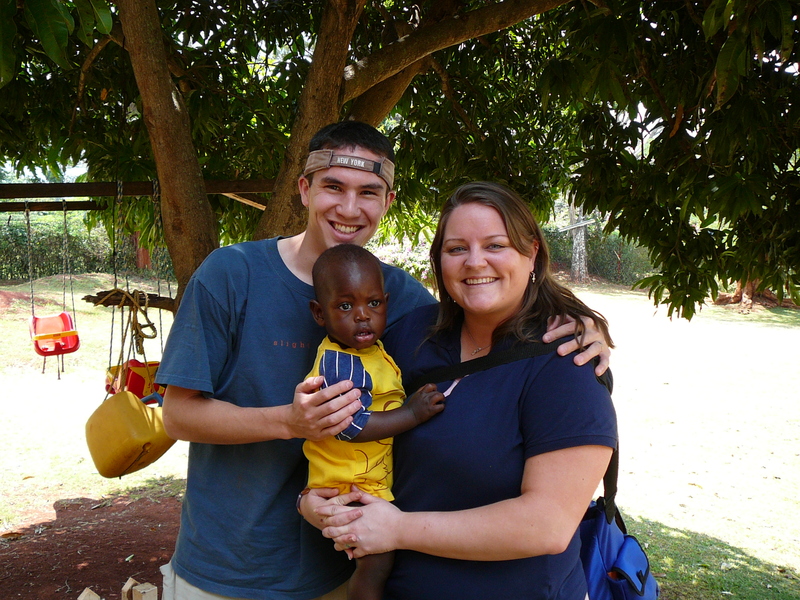 We’re not quite sure how to handle this right now since he’s not officially in our care, but we know that time, observation, and submitting to the orphanage’s well-run and obviously-proven ways will be our best preparation for training Judah when we become his full-time parents. Today we took Judah out on our own for the first time. We walked back to our hotel with him and spent an hour playing. It was a sweet time, and very normal. He’s a very curious and active boy who is very content in your arms as long as you’re standing and walking, but as soon as you sit down he wants to get off. Of course, once you’ve held him for about five minutes, you’re physically ready for him to get off, too. But affection and love override the feeling that you’re working out with a 25-pound dumbbell and you just hold him for hours. Now, to hopefully provide a tiny bit of satisfaction to some of the salivating parents who are checking this blog every thirty minutes for news or pictures having to do with us and Judah and the adoption process and (most of all) their own soon-to-be-adopted kids (you know who you are), here are some brief descriptions of a few of the kids whose parents we know. Olivia Tatlock is a very happy, responsive baby. She enjoys attention and doesn’t disappoint you when you try to get her to smile. Her face gets pretty scrunchy when she smiles, and it looks a bit like she’s giving you a mischievous, happy growl. During family time on the lawn (around 3:30-6:00pm every evening), she sits in a little plastic encircled seat so that she doesn’t fall over. She’s very content and gives her attention to whoever comes over to say hello. Cindi and I have agreed that she has an incredibly sweet personality. Paul is a very kind, considerate boy (of course — he’s a Tatlock!). The Ugandans call him “Paulo” (think “Powlo”). A few days ago one of the kids had gotten out the front gate and was prepared to wander down the street. 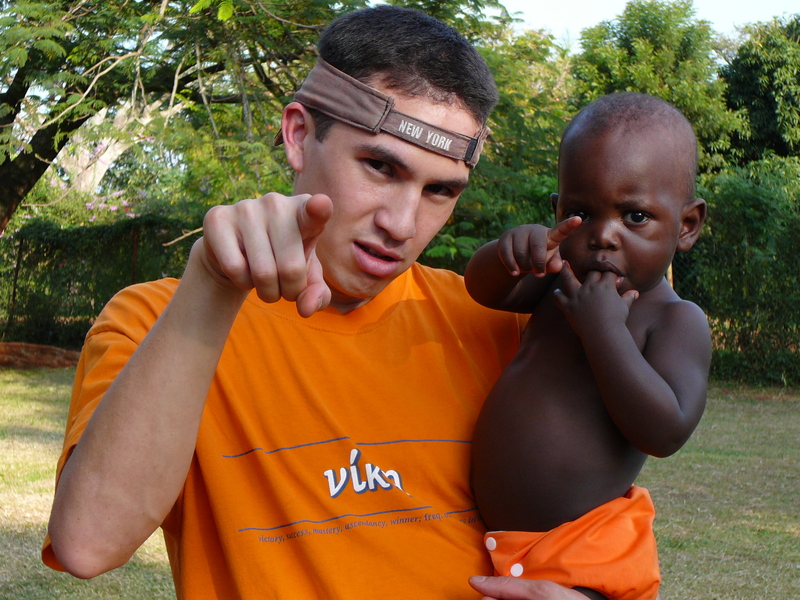 Paul said to Cindi, “Auntie, he got out!” (with a thick Ugandan accent) and pointed at the roaming boy. Paul wanted to make sure he didn’t wander off. He loves to hug and smile, and he’s a pretty personable guy. We have a minute-and-a-half video of me trying to teach him to hit a baseball. He didn’t know how to hit it out of the air, but he’s pretty adept at hitting it off the ground. Perhaps he should play golf. I think he will fit in quite well with his little sister and the Tatlock family. Even among the adopting families in Southern California, Jay has a reputation for being mischievous. When we first arrived, he was living up to it — he was in trouble (we don’t know what for). They were putting the toddlers in two groups, and Jay was in the bad group that didn’t get to be part of storytime. But in our experience he has been a very friendly boy. I think that part of his reputation comes from his awesome smile. He looks pretty sly — like maybe he knows something that you don’t. Whenever he sees Cindi without Judah, he asks her “Where is baby Judah?” Yesterday he came and gave us stickers for our faces because some former volunteers had sent individual cards to each child along with little stickers. We like to tell Jay and Paul that we will see them a lot in America because we know their parents. They don’t really know what we’re talking about, but they know it’s good. 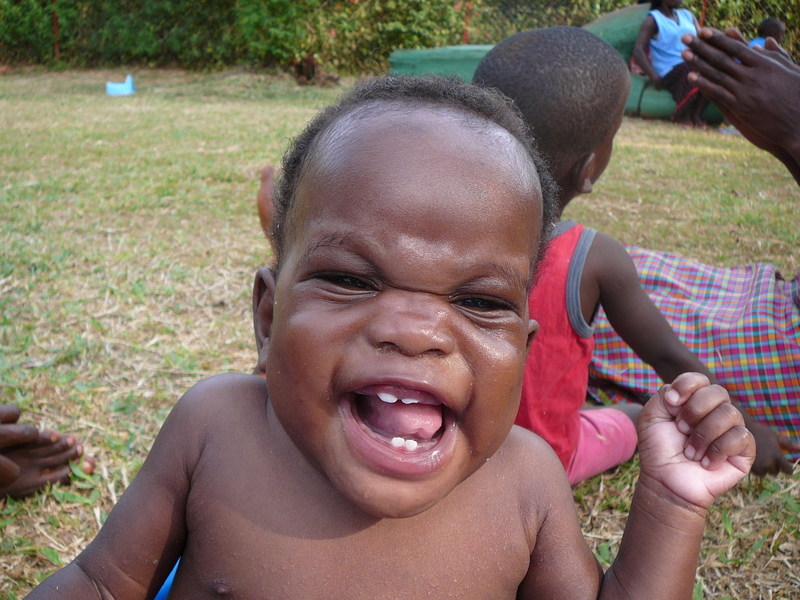 From my perspective, Jay is an active, spunky boy who loves life and lives like he smiles. And (speaking from complete parental ignorance) I’d rather harness and channel a boy’s energy than have to light a fire under him. That’s at least how it is with the college guys I work with. We don’t get to spend much time with Noah and Chloe, but they smile a lot when we see them. Noah doesn’t seem to like eating, but the Ugandan mamas are persistent. Maybe he’s holding out for American junk food. They seem like pretty calm children (except when Noah is eating) and I personally think they look like brother and sister. The Lord has given great grace today in enabling me to post a few pictures. So far, posting even a single picture has been comparable to sticking red-hot pokers in your eyes. Ok, it’s not quite that bad — probably more like putting a red-hot poker in one eye. But we’re doing everything we can, as long as we have eyes left. Today, by the goodness of God, you get more than a couple pictures. As beautiful as these children are, equally beautiful is the picture of God’s providential goodness that each smile and each set of brown eyes represents. Look at them and ask yourself: Does God not love children? Olivia Tatlock — All Smiles! I’m off to a Good Friday service at the home of some missionaries in the area. May your weekend be filled with the glory and joy of a risen and reigning Savior! From Africa to America, Christ is all. What a precious family! As we prepare for the wedding of our eldest adopted child next weekend, I have to smile when I think of the sweet years ahead of you! PTL!!! I”m soooo excited for you guys! Thank you for so much detail and so much thought. Now I know what my Mom meant when she said Judah & Gunner have the same cheekbones! I’m so thrilled for you and Cindi. May God bless you abundantly more than you can ask or imagine. May God bless you as you learn to be mom and dad to one of God’s precious little ones. Thank you so much for the update. Like everyone else I teared up. What a great testimony of God’s goodness and faithfulness. I am so glad these children are loved so much. We look forward to meeting Judah someday. Hi from Lisa and the Tatlock kids! Thank you so much for the update. It paints a great picture of life at Amani and in Uganda – we can’t wait to experience it ourselves! The pictures are so much fun! Thank you! It is wonderful to see the three of you together. My heart is full of joy for your family. I love seeing Paul and Olivia with you – I have never seen Olivia smile so big! As Cheryl said, thank you for loving our kids in advance and keeping us connected to them. We will be in constant prayer for you. In the Pari house there is a collective AAAAAHHHH! Thank you for sharing your lives with us and loving our children in advance of our arrival (and for our “surprise” this morning). The picture of the three Gundersens together gave me chills. After all this time, you are finally together. Thanks for the encouraging words about our little “fireball”. The LORD knows and is putting J.J. in a family full of people just like him (especially his mommy and big brother). Will be talking to you soon. Our prayers will not cease. Wow. What an amazing update. What a good, great and awesome God we serve. Precious–every photo and every detail! You continue to be in our prayers.